Many protein-protein associations that exist within the cell remain intact when a cell is lysed under non-denaturing conditions. Co-immunoprecipitation, advanced technique developed from immunoprecipitation, is the most straightforward way to determine whether two proteins of interest are physiologically associated in vivo, and also to identify interacting partners of a target protein. In both cases, the cells are collected and lysed under non-denaturing conditions that preserve protein-protein interactions. The target protein is specifically immunoprecipitated from the cell extracts using target-specific antibody, and the immunoprecipitates are fractionated by SDS-PAGE. Co-immunoprecipitated proteins are detected by western blotting, ELISA with an antibody directed against that protein, or mass spectrometry with high accuracy. 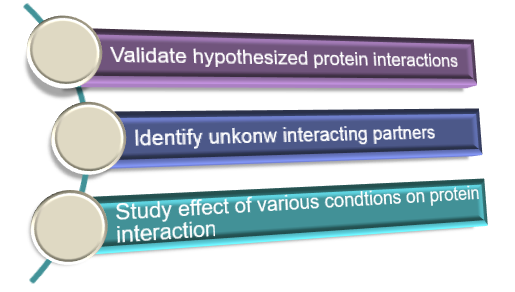 Creative BioMart’s co-IP platform will assist you to identify new binding partners and possible new signaling pathways of your target protein. With proper design of the study, it can also provide information regarding the presence, abundance, up regulation or down regulation, even post-translational modifications of your target protein, thereby elucidating signaling pathways. See the procedure of co-IP service and how you should submit your sample. Our experts shall design your co-IP experiment according to your specific requirements and we will provide detail data of the result and procedure.